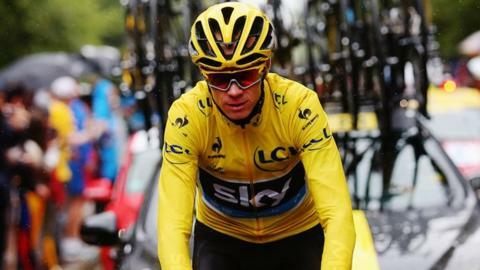 Briton Chris Froome will aim to become the third rider in history to win the Vuelta a Espana and Tour de France in the same year when the third and final Grand Tour of 2015 starts on Saturday. The 30-year-old has twice finished runner-up in the Spain event. "I've had a good rest and I'm ready for my next challenge," he said. Will Froome join a select group? Frenchmen Jacques Anquetil (1963) and Bernard Hinault (1978) are the only riders to have previously won both the Tour de France and the Vuelta in the same year. However, the first day's team time trial will not count towards the overall standings after complaints from cyclists about safety on the course. Vuelta spokesman Ivan Gomez said that some riders had complained about the course, starting in the southern coastal town of Puerto Banus and ending in Marbella. They had concerns that it "did not have sufficient safety guarantees'' because of a stretch along the sea that goes through dirt. Both Froome and Team Sky stablemate Geraint Thomas had complained. As a result, cycling's governing body the UCI decided that Saturday's 4.6-mile stage will only count for the team classification, not individual times. Tour de France runner-up Nairo Quintana and 2014 Tour champion Vincenzo Nibali will also compete. Defending champion Alberto Contador is the only one of the top five from this year's Tour not to take part in the three-week test of endurance.